I’ve made three holiday cookies/dessert recipes over the last week, I’ll be making two more for our annual department cookie swap tomorrow, and I’ll be coming home from the cookie swap with an entire container full of about a million more cookies… I’m certainly not complaining, but around this time of year I always try to make sure I make my meals as healthy and nourishing as possible to help balance out the excessive cookie consumption a little! 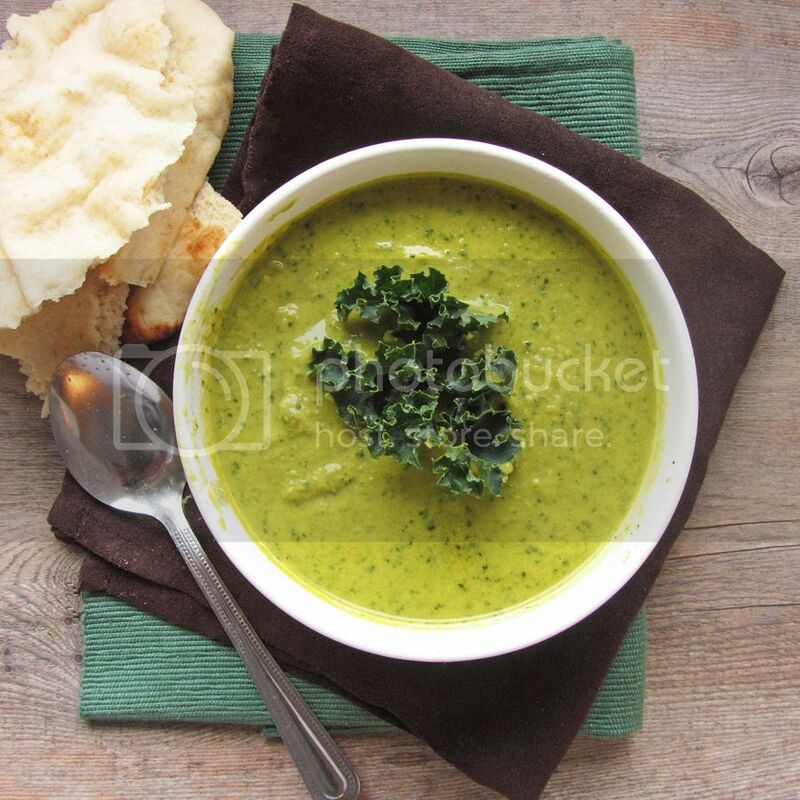 When I saw this pretty green soup in Clean Eating magazine, I knew it was just what I needed, plus it featured a flavour combination – curry powder, kale, chickpeas, and coconut milk – that I hadn’t seen before in a soup! And it used beans as a thickener, which I liked so much from the roasted tomato & white bean soup I tried last week. Heat oil in a large saucepan over medium-high heat. Add onion and sauté until soft and translucent, about 4-5 minutes. Add garlic and ginger and sauté for another 30 seconds to 1 minute, stirring occasionally. Add curry powder and cumin and stir together for about 30 seconds, until fragrant. Add vegetable stock, coconut milk, chickpeas, and kale, and let simmer for about 10 minutes, stirring occasionally. Transfer soup to a blender in two batches, remove the plastic stopper from the top of the blender and cover with a paper towel to allow steam to escape. Puree until smooth, then return to saucepan. Add honey and season with salt and pepper to taste, reheating the soup for a couple of minutes. If the soup is too thick, add more vegetable stock or water to thin it out to desired consistency. Serve warm with naan bread. I'm totally going to make this. 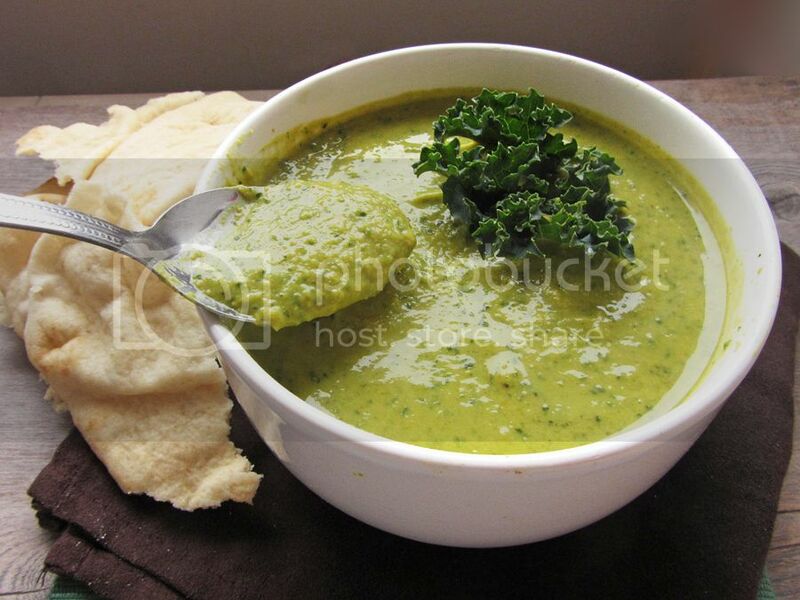 I love soups and this looks pretty easy and healthy. This is going on my to-make list! Even though it's a little high in calories, I love adding coconut milk to soups. The smell when it's cooking is out of this world! I do the same thing at this time of year! It's healthy soups all the way. And this looks super awesome. Kale, chickpeas and coconut? My favorites all in one bowl!